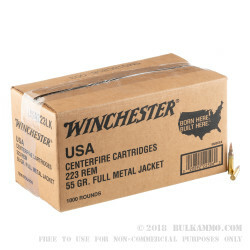 These 1,000 223 Rem cartridges by Winchester come in a big brown box, no bells or whistles. If all you want is 26 pounds of hard-hitting ammo that will keep you busy at the range for hours, and you don’t give a fig about colorful graphics, then you’ve come to the right webpage. This cartridge sports a 55 grain projectile, which is the most common loading for its caliber. Its bullet features a full metal jacket which toughens it for likelier target penetration and also the prevention of rapid bore fouling, so you can enjoy better accuracy for longer in between uncapping the Hoppe’s. 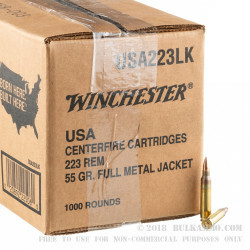 This cartridge also features a factory fresh brass casing and non-corrosive Boxer primer, so you can keep handloading this big brown box’s contents for a very long time. Their affordability is in no way indicative of these rounds’ ability to perform any way other than admirably. Winchester is an American icon, no two ways about it, so you can always invest in their products with confidence. 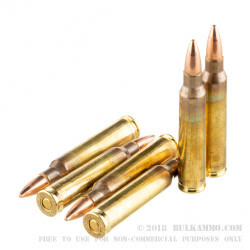 Q: Are these rounds a 100% brass jacket or is it a bimetal jacket? Are the rounds magnetic? A: Hi Nick. 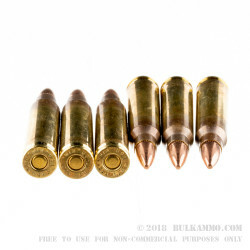 These rounds are 100% copper jacketed and brass cased. They are NOT magnetic and should be good to go on any range!